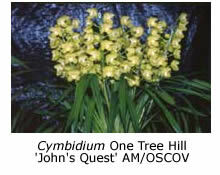 The first step for most new growers in Melbourne is to buy a flowering cymbidium orchid. It’s the best choice for our climate because cymbidiums are tough, easy-to-grow plants that produce many colourful blooms under the correct cultural conditions. Perhaps the most important factor in good cultivation is location. 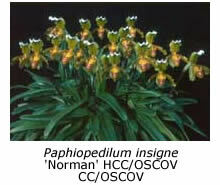 Cymbidiums need good light but will burn if exposed to direct summer sunlight for long. In total shade they grow well but usually fail to flower. If you have only one or two plants they may be grown in the shade of a tree, such as a eucalypt, that provides dappled shade. Better results are usually obtained by erecting shadecloth (50% shade factor) over an open area that would otherwise receive full sunlight for most or all of the year. An added refinement is a fibreglass roof, fitted about a foot below the shadecloth, that will protect the plants from excessive rain in winter, and solid walls or plastic sheeting on the southern and western sides to block cold winter winds. Cymbidiums also need good air circulation, by way of exposure to gentle breezes, not howling winter gales. They are unharmed by temperatures down to freezing in winter, however, flowering spikes are damaged by severe frosts and it is necessary to bring plants in flower or spike under cover if frosts are forecast. A fibreglass roof provides protection against mild frosts but not severe ones. Cymbidiums can withstand temperatures up to 40°C in summer, provided that they are watered regularly and a humid atmosphere is maintained. In fact, it is almost impossible to over-water them in hot weather. 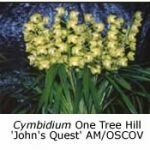 After mastering the art of growing and flowering cymbidiums successfully, the novice grower usually begins to add other cool-growing orchid genera to the cymbidium collection. Suitable companion plants are Australian native dendrobium and sarcochilus species and hybrids, and cool-growing species such as Coelogyne cristata, Laelia anceps and Paphiopedilum insigne. Zygopetalums are also good companion plants for cymbidiums; apart from the unusual purplish or mauve lips of their flowers, they are delightfully perfumed. These add variety to the collection and may extend the period during which the plants are in flower. 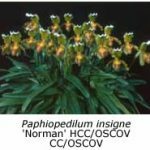 With experience, other genera, such as masdevallias, odontoglossums, cattleyas, oncidiums and disas can be added to the collection. Eventually it is possible to have orchids in flower on every day of the year. At this stage you have graduated – you are no longer a novice but a fully fledged experienced orchid grower! Your progression through the various phases of orchid growing will be greatly facilitated if you join an orchid society. Some societies hold an early session, before the main meeting, specially aimed at novice growers, to ensure that they are aware of the cultural needs of their orchids (watering, fertilising, repotting etc) at that particular season. Most societies have a competitive orchid display at each meeting, which helps the new grower to decide which orchids to grow, while a guest speaker discusses some aspect of orchid growing at most meetings. These cultural notes are kindly provided by the North East Melbourne Orchid Society. Details of when and where this and other OSCOV member societies meet may be found under societies on this web site.